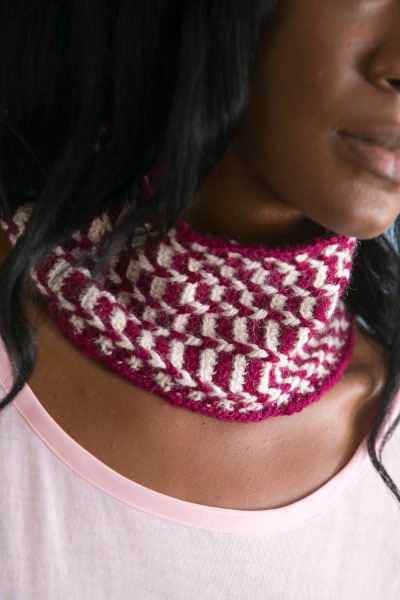 Add warmth without the bulk with the Weekend in the Alps Neckwarmer. This simple, cozy accessory will protect your neck against chilly winter drafts, and the buttons make this winter staple a breeze to put on. 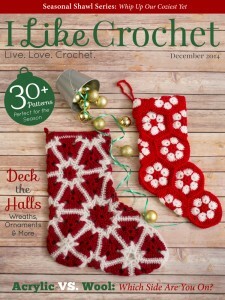 FPdc (front post double crochet): Yo, insert hook from front around post of next st from previous row. Yo and draw up a loop around post. *Yo and draw through 2 loops. Repeat from * once. Skip st behind FPdc. All sc throughout are worked in front loop only. Carry unworked colors up side. Work edging over unworked colors. Row 2: Turn, ch 1, sc in each st across. Rows 3-9: Repeat Row 2 7 more times. Row 10: Repeat Row 2, changing to CC in last yo of final sc. Row 11 (RS): Turn, ch 1, sc in first st and next st, (FPdc around next st from previous row, sc in each of next 4 sts) across to last 3 sts, FPdc around next st from previous row, sc in last 2 sts. Row 12: Repeat Row 2, changing to MC in last yo of final sc. Row 14: Repeat Row 10. Rows 15-130: Repeat Rows 11-14 twenty-nine more times, or until approximately 20” (50.75 cm) long. Row 131: Turn, ch 1, sc in first st and next st, (FPdc around next st from previous row, sc in next st, ch 2, skip 2 sts, sc in next st) across to last 3 sts, FPdc around next st from previous row, sc in last 2 sts. Row 132: Turn, ch 1, sc in first st and in each st (including chs) across, changing to MC in last yo of final sc. Fasten off CC. Row 133: Repeat Row 11. Row 134: Repeat Row 2. Do not fasten off. Rnd 1: Turn, 2 sc in first st, sc in next st and each st across row to last st, 3 sc in last st, *turn and work along long edge of neckwarmer, sc in side of next row and side of each row across to last,* 2 sc in last row, turn and work along short edge, sc in unworked side of first ch and in unworked side of each ch across to last st, 3 sc in last st, repeat from * to * once, sc in last side of last row, join with sl st to first sc, fasten off. 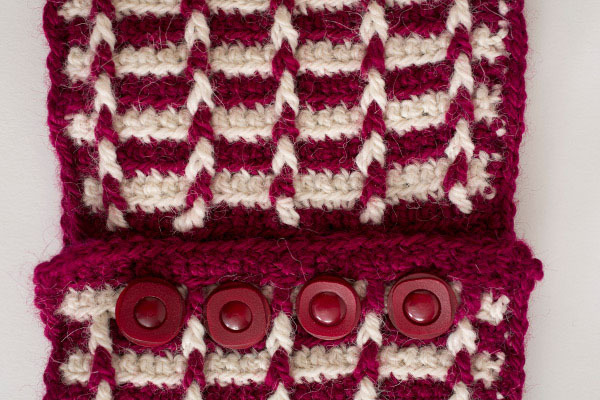 With RS facing, center buttons along Row 6 to match with buttonholes in Row 131. With tapestry needle and MC, sew buttons in place. Weave in ends.